By now you MAY have heard the harrowing truth I am about to reveal. It's prying and crawling its way back into our lives. It's lurking in the shadows, ready to pounce into the homes of children everywhere. It's a biology experiment gone terribly wrong. The creature's colorful, furry coat is a poor distraction from the rest of its haunting features: a snippy little beak where its mouth should be; the complete absence of arms or wings; an enormous pair of bat-like ears that shift when it senses your presence. And the eyes--oh, the eyes! How they burrow straight through your soul and into your nightmares! More resembling oversized saucers than anything, they demand your full attention, lest you be forced to endure the beast's bone-chilling cry. This creature I'm describing to you is none other than Furby himself...and he's back. 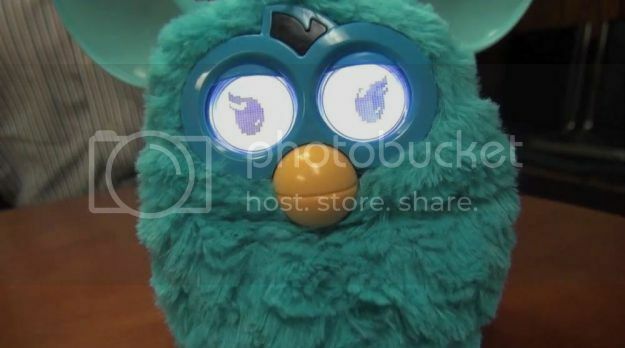 Furby has returned and is more frightening than ever. How, you ask? How could this eerie genetic anomaly get any more alarming than it was in 1998? Not the kind of digital you see on your iPad or an Xbox. No, no. That would be far too gentle for this brutish devil. The kind of digital you see on alarm clocks and Tomagachis. The kind of pixelated creepery that has no place on Furby 2.0. Furby: Reloaded also has a corresponding iOS app and personality development. I maintain that we are giving these Grendel-descendents too much power, and it will be our undoing. Let me tell you a secret: my original Furby (which I paid for with lemonade stand money--true story) still sits on a shelf in my bedroom at my parents' house to this day. I think it's because he simply willed himself to remain there. In the last 14 years, this thing has not been lost, donated or thrown away. Even if we had, you know it would have come back Toy-Story style (only much more like that fishing rod with barbie legs or one-eyed spider-baby than Buzz or Woody). I imagine he will sense a disturbance in the force when Furby 2.0 arrives. His eyes will shoot open and he will begin communicating with the new fleet of Furbies, acting as a spy until they finally have enough manpower to overtake the planet. These are dark times, my friends. Dark times. Be vigilant; for the time is fast approaching when Furby will be back on the shelves and under the Christmas trees of unknowing parents all across this good nation of ours. And we must be on our guard. For, if nothing else, just as its 1998 predecessor, Furby 2.0 has no "off" switch. And those things never shut up. Did you have or want a Furby? Why or why not?